Gentle Transitions Minnesota Featured in St. Paul Senior Workers Monthly Newsletter. Diane Bjorkman has continued to fuel her passion for working with older adults for the past 32. 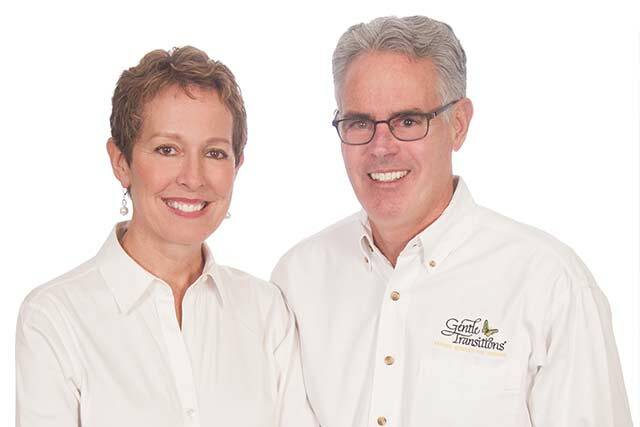 In 2001, she and her husband Bill Lehman (previously working in the Options trading profession) joined forces in the ownership of Gentle Transitions, established in 1990 and very likely the first senior move management company in the country and certainly the Twin Cities. Gentle Transitions is a full range senior move management company with services including packing, getting rid of unwanted possessions, unpacking and total resettling, assisting in staging and decluttering as well. The bulk of Gentle Transitions clients are middle income clients but they are proud to have an option for those on Elderly Waiver/MSHO as well (email to inquire). Diane and Bill strive to provide outstanding service to each and every client. They believe in the importance of getting a friendly voice answering the phones throughout the daytime hours. Appts to visit clients are established within hours of the client's inquiry. If there are requests the client has that Gentle transitions does not do, they find a professional, experienced resource that can assist in that area. Knowing that their employees are the face of their company, Diane or Bill continue to interview and select each employee and provide ongoing training. They expect their employees to create the "Wow" factor with each client's move, so they invest a lot in support of the employee team. "In 23 years of service, Gentle Transition's model has not changed: Each client works with one Move Manager throughout the entire process, allowing a sense of trust and a camaraderie to serve that client from beginning to end. Customer service has been paramount to Gentle Transitions since Day One." Diane and Bill have four daughters ranging in age from 14 to 38 and a nine year old granddaughter as well, all but one living in the Twin Cities. Gentle Transitions serves the entire metro and outlying areas in addition to coordinating moves from out of state. Say hello to Diane at the next meeting, or feel free to contact Gentle Transitions with your questions.